My Favorite Things, Day 4: Slow Cooker Giveaway! My Favorite Things, Day 5: $100 Target Gift Card Giveaway! I tend to go really overboard with the holiday baking throughout most of December, and as a result, there are many nights that I really don’t feel like cooking dinner when 6 pm rolls around. We’ve ordered more than our fair share of pizza and Chinese take-out this month, which I guess is slightly better than just eating cookies instead? Luckily there are a few shortcuts that can make a homemade dinner a lot easier during this crazy month, and for me, many of them involve the slow cooker. Soups are great because there’s usually not too much prep work involved and most recipes make enough to feed us for days and days. I also love braising meat in my slow cooker and freezing it in portions that can be pulled out later for a quick dinner. Pulled pork was always my go-to in that category, but in the past few months we’ve fallen in love with this smoky shredded chipotle beef as well. The beef is braised in the slow cooker in a tomato and chipotle sauce, which gives it great smoky flavor and keeps it moist and tender. You could probably use the beef in a number of ways but I highly recommend these burritos. 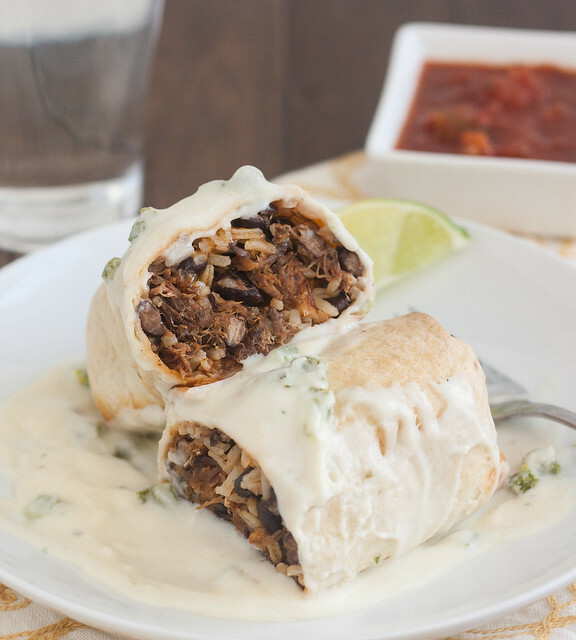 The beef is combined with rice, black beans, and cheese, and rolled up in a tortilla that’s then sprayed with cooking spray and baked for about 20 minutes. 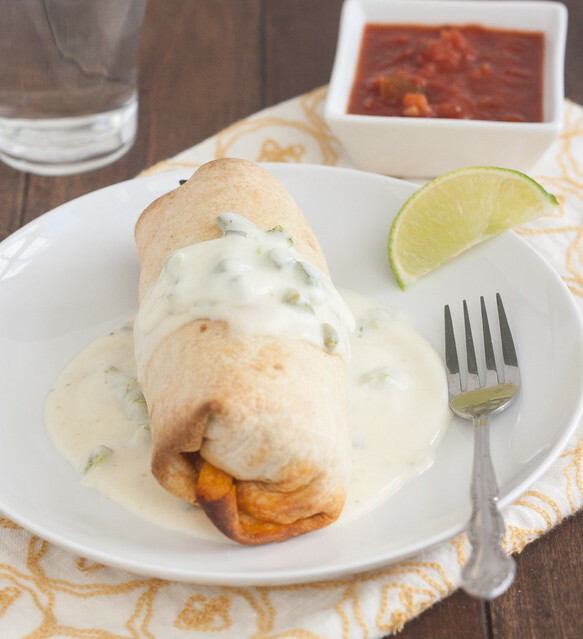 The result is a burrito that’s crispy and golden on the outside with a super flavorful filling. 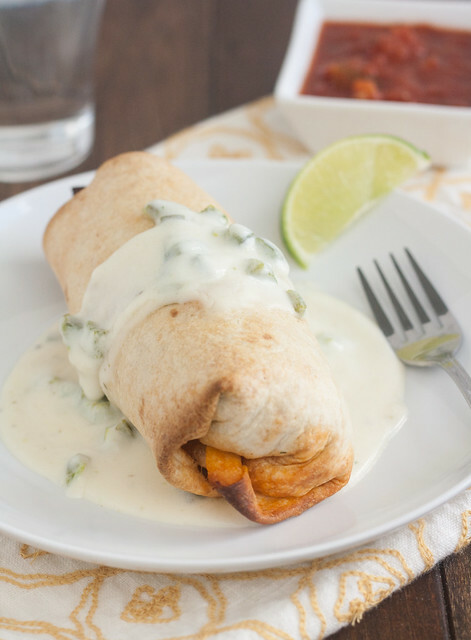 And as if that weren’t enough, the burritos are topped with a simple creamy poblano sauce. The burritos are awesome on their own so the sauce is definitely optional, but I think it is worth the extra few minutes to prepare. PS – The fourth day of holiday giveaways is live! Hint, hint: the prize might help you make today’s recipe – enter here. Add the onion, chili powder, chipotle, oil, garlic, jalapeno, tomato paste, and cumin to a microwave-safe bowl. Microwave for about 5 minutes or until the vegetables have softened, stopping to stir a few times throughout. Transfer to your slow cooker. Mix in the tomato sauce, brown sugar, and liquid smoke. Season the meat all over with salt and pepper, then add to the slow cooker and turn to coat with the sauce. Cover and cook until the beef is very tender, about 9-11 hours on low (or 5-7 on high). Remove the beef to a large bowl or platter and allow to cool slightly, then shred into bite-size pieces. Cover with aluminum foil to keep warm. Meanwhile, allow the braising liquid to settle for about 5 minutes, then skim the fat from the surface with a spoon. Add about 1 cup of the braising liquid to the shredded beef (or more as necessary to keep it moist). Use to make burritos. Alternatively, you can refrigerate the meat for up to 3 days or freeze for 1 month, if making ahead. To make the burritos: Preheat oven to 400 F. Line a baking sheet with aluminum foil and spray with nonstick cooking spray. In a microwave-safe bowl, combine the filling, beans, and rice, and microwave for about 2-3 minutes, or until hot (stirring once or two throughout). Mix in the cheese and the parsley. Season to taste with salt and pepper. Lay the tortillas on your work surface. Place about 1/4 cup of the filling onto the center bottom third of each. Fold the sides of the tortilla over the filling then roll the tortilla up tightly from the bottom. Place seam-side down on the prepared baking sheet. Spray the burritos with nonstick cooking spray and bake for about 20 minutes, or until golden and crispy. To make the sauce: Roast the poblanos until blackened on all sides – I did this on my gas stovetop, but you could also use your oven’s broiler if you’d rather. Once blackened, place the poblanos in a large bowl and cover the bowl with plastic wrap. Let stand for 10-15 minutes, then peel the blackened skin from the pepper. Remove the ribs and seeds from the pepper and dice. Add the butter to a medium saucepan and place over medium heat. Allow the butter to melt, then add the flour and whisk constantly for about 1 minute. Gradually add the chicken broth then the diced poblanos, whisking constantly until combined. Simmer, continuing to whisk frequently, until the sauce has thickened. Stir in the sour cream and cook until the sauce is warmed through. Season to taste with salt and pepper and serve over the burritos. 11 Responses to "Slow Cooker Smoky Shredded Chipotle Beef Burritos with Poblano Sauce"
Holy moly!!! These burritos look amazing!! These burritos were awesome, I can’t wait to have them again! This looks so so good!!! I never cook with cuts of beef (just ground beef for some reason). My husband would flip if I made this! It looks delicious. Crock pot is bonus. I really need to start using my slow cooker more. These burritos look awesome! I totally did not cook/have dinner last night. Out of sheer laziness. This recipe could have gotten the job done. This meal is right up my alley and such a bonus that it’s made in the slow cooker! Seriously…LOVE my slow cooker too this time of year! These burritos look so fantastic..I love everything about them! Oh my goodness! That looks so good! I am definitely trying it next week! My husband loves burritos and I love using the crock pot! Oh man, this burrito looks so tasty 🙂 something my husband would be all over!! Oh giiiiirl! These look dangerously addicting!!! I need. Made these tonight sans Poblana sauce. Very good, cooked faster than recipe but my slow cooker runs hot. Instead of microwaving the slow cooker ingredients I blended them all in my food processor then added to the slow cooker, then the meat. I did omit the jalapeno and liquid smoke. Thank you for the recipe, will make it again.